In July last year, it was reported that iconic Japanese watchmaker Casio had its sights set on entering the smartwatch market in 2016. The company has stuck to this promise and revealed the Casio Smart Outdoors Watch WSD-F10 at CES. As the name suggests, this Android Wear device is firmly aimed at the outdoors - its ad campaign targets the likes of hikers, runners, mountaineers and cyclists. The WSD-F10 is waterproof and shockproof to US military MIL-STD-810G standards, meaning it will work in water up to 50m deep and is more likely to survive a fall from a mountain than the person wearing it. The watch has an atmospheric pressure sensor built in, as well as an altimeter, accelerometer, gyrometer and a compass. It comes with some specific apps and tools pre-installed especially for outdoor activities - such as a fishing app that tells you atmospheric pressure tendency and high and low tides, as well as alerting you to the best times to fish based on your current location. The WSD-F10 features a dual-layer, 1.32-inch display with a 320 X 300 pixel density. Its monochrome mode only tells the time and has some basic faces, but the watch will last a full month without needing a recharge when used constantly in this mode. The regular full-color mode lets you have the complete Android Wear experience, albeit with a pretty limited battery life – Casio says that at full use it’ll last about 7 hours. With a case measuring 61.7mm × 56.4mm × 15.7mm, the WSD-F10 is fairly huge. Much like the majority of Casio’s similarly tough G-shock range, the smartwatch's chunkiness will look colossal on slender wrists. While the device supports third-party tracking apps such as Runkeeper and ViewRanger GPS, it doesn’t contain a GPS system; you’ll have to use a tethered smartphone for location services. 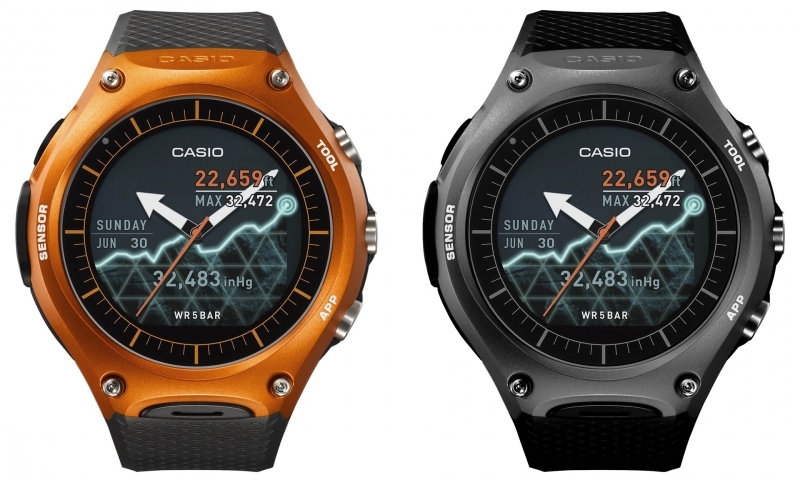 The Casio Smart Outdoor Watch WSD-F10 will launch in the US in April (and Japan in late March) and be priced around $500. It will be available in black, orange, red, or army green colors.